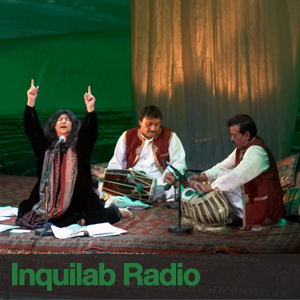 Inquilab Radio showcases the best of Pakistani music, follow Mariam and Usman as they look at all genres, from Sufi Rock to Eastern fusion, from Taqwa Core to Eastern Classical. Inquilaab is an Urdu word meaning “Revolution”, and that is exactly the pathway of Pakistani Music. It’s a nexus for the youth of Pakistan to express themselves in the midst of all the chaos that the country seems to face perpetually. While everything from terrorism to inflation, to politics to social issues threatens to rip its people apart, we remain united by a force more powerful than all them combined: harmony. It is this harmony which accentuates itself through the power of melodies. Through their voices, and through their creativity, Pakistani artists have used music to express their thoughts and opinions in all forms...whether it be human evolution or social revolution...dissent or discontent...local politics or global politics...unity or faith...and as always a message of peace. Come and be a part of the sea of change, as once again we connect distinct and varied styles, ethnicities and identities, and link them with that one common denominator — Music. On this week's show Mariam chats to SOAS student Mavra on the culinary delicacies from South Asia. Tune in to hear how to make a good palak-chicken and the essential types of naan bread. All in between the usual musical dose. Taking it to the next level: This week Mariam looks at the variations that lie between traditional Ghazal sounds and the more modern Qawali attempts. Inquilab for beginners- this week Mariam and Usman introduce Pakistan's latest Music sensation: Sufi Rock.